Mayor Eric Papenfuse has declared liberal leave in effect for all non-essential personnel on Wednesday, March 7, 2018, due to forecasts of severe weather. Please notify your supervisors if you intend to use vacation or personal time. And please check the city’s website, Facebook pages, Channel 20 and/or office emails for potential updates on the weather situation. The goal of these programs is to develop viable urban communities by providing decent housing, suitable living environment and expanding economic opportunities principally for low and moderate income persons. The program year will start on October 1st, 2018. CDBG, HOME and ESG funding accomplishes the City’s housing needs as related to the availability of an access to affordable housing, fair housing, infrastructure, economic development and assistance to the homeless. These meetings will provide a review of program progress, an overview of the City’s current housing and community development strategies, and an opportunity for citizens to present their views on the City’s housing and community development needs. A Spanish translator will be available at all meetings. All facilities are handicap-accessible. The public must present identification in order to attend this meeting. If sight/hearing persons require accommodations at either location, they may call DBHD (717) 255-6419 to make arrangements. Accommodations may include sign language or assistance interoperating visual materials. The City will accept written proposals for funding of eligible activities that are consistent with the City’s housing and community development strategies. Proposals will be available January 22nd. You may visit the city website or contact Rumulus Brown for a proposal form, instructions for submitting a proposal, criteria for eligibility and funding priorities, and other assistance. If you plan on submitting a proposal, it is recommended that you attend the following pre-proposal workshop. You must register in advance for the workshop by calling (717) 255-6419. The Citizen Participation Plan is available for public review and comment, the Citizen Participation Plan is the City’s mechanism for encouraging citizen comment and involvement in developing Harrisburg’s Consolidated Action Plan, as well as reviewing the City’s performance reports and amendments to the Plan. This notice shall satisfy the above-cited two separate but related procedural notification requirements. On January 22, 2018 the City of Harrisburg, Pennsylvania will submit a request to the U.S. Department of Housing and Urban Development (HUD) Region III for the release of Community Development Block Grant (CDBG), HOME Investment Partnerships Program (HOME), and Emergency Solutions Grant (ESG) program funds under Title 1 of the Housing and Community Development Act of 1974, Public Law 93-383, as amended; 42 U.S.C.-5301 et seq. (CDBG), Title II of the Cranston-Gonzalez National Affordable Housing Act (42 U.S.C. 12701 et seq. ), (HOME), and The HEARTH Act amends Subtitle B of Title IV of the McKinney-Vento Homeless Assistance Act (42 U.S.C. 11371-11378) (ESG), to undertake a project included in City’s 2016 Annual Action Plan which has been approved by HUD. Funding provided for bathroom improvements at the Heinz Menaker Senior Center. Funding to place a construction fence around houses subject to demolition on South 14th Street due to a sinkhole having formed there in the past several years. The City will also use funds to board up houses prior to demolition and cut the grass and remove snow. The City will be taking ownership of the houses in the near term (November 2017) and will use other federal grant funds to initiate demolition activities. The City of Harrisburg has determined that the project will have no significant impact on the human environment. Therefore, an Environmental Impact Statement under the National Environmental Policy Act of 1969 (NEPA) is not required. Additional project information is contained in the Environmental Review Record (ERR) on file at the City’s Department of Housing which is located at the address above. Members of the public may review the ERR at the Department of Housing, 10 North Second Street, Harrisburg, PA 17101. The ERR can be examined or copied weekdays 9A.M to 5 P.M.
Any individual, group, or agency may submit written comments on the ERR to the Department of Building and Housing Development All comments received by January 22, 2018 notice date plus fifteen days; will be considered by the City of Harrisburg prior to authorizing submission of a request for release of funds. The City of Harrisburg certifies to HUD Region III that Eric Papenfuse in his capacity as Mayor consents to accept the jurisdiction of the Federal Courts if an action is brought to enforce responsibilities in relation to the environmental review process and that these responsibilities have been satisfied. HUD’s approval of the certification satisfies its responsibilities under NEPA and related laws and authorities and allows the City of Harrisburg to use Program funds. Potential objectors should contact HUD to verify the actual last day of the objection period. Help us in conducting a study to improve bus stops along six important streets. Please fill out survey here: https://www.surveymonkey.com/r/HarrisburgBusStopOptimizationStudyandShelterDesign. 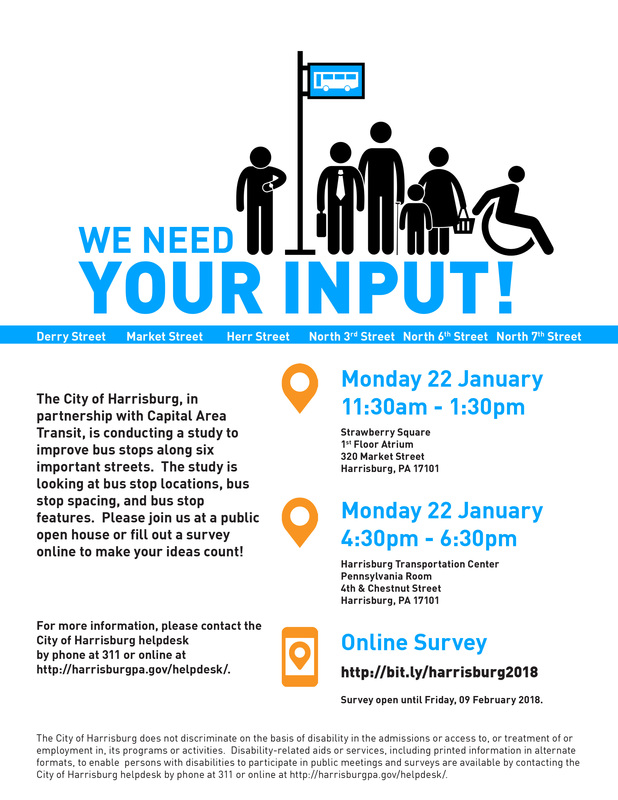 You can aslo join us at a public open house on Monday, January 22 from 11:30 a.m. to 1:30 p.m. at Strawberry Square or from 4:40 p.m. to 6:30 p.m. at the Harrisburg Transportation Center. Please be advised that due to the extreme cold weather we have suspended installations of requested Handicap signs for the winter. For this operation to restart all snow must be melted and the ground thawed to allow for sign post installation.